Thank you for taking a moment to be Here reading my first post. There is a first for everything and I don’t quite know where to begin. I am simply allowing what comes as my fingers press the keys. Life is a mystery and I am so overjoyed to be a part of it, to be witness to it, to be it. I stood in the post office today and was in awe of the people sending packages to loved ones, of the workers taking their time with each customer… I know it sounds funny, but I truly felt that there is beauty everywhere, in each moment in which we breathe, and witness and watch things as they are. I so appreciate seeing the people in my life discover new things, discover what brings them joy, discover their truth. I am (in)joying the unfolding of our journey. 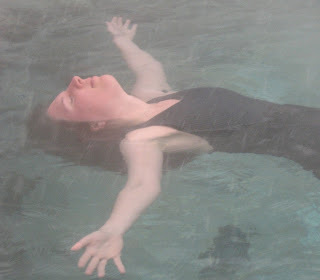 Here I am in one of my most peaceful moments, floating in the warm, healing waters of the earth. It happened to be snowing (what beauty! )… it was so quiet, just the water, the snowflakes, and my witnessing presence absorbing it all, feeling it all, becoming it all. This entry was posted in Just In This Moment and tagged Heart. Bookmark the permalink.